I don't know why, but this Color Club color Hot Like Lava keeps making me think of the Maroon 5 song "Moves Like Jagger." I don't get it. If the song is now stuck in your head, I'm sorry! Hot Like Lava is a red metallic foil from the Foiled collection. I originally hated this - thinking it was too much like the rest of the metallics out there. I used a base coast of Zoya Get Even for my ridges, and just 1 coat of Hot Like Lava. I did not use a top coat. This polish was a little on the thick side but I used as thin of a coat as I could and it was completely opaque. Okay, so this color is a lot more pink than I originally though - and surprisingly, I really like it! It just pops on the nail, and I enjoyed wearing it. I felt like I had mild lobster hands in the shade but still - look how smooth the formula is on my nails! If you had to get a color from this collection, I'd say get this one. I'm a big fan. This collection is so good!!! this is really pretty and I can't believe this is in my untrieds!!! 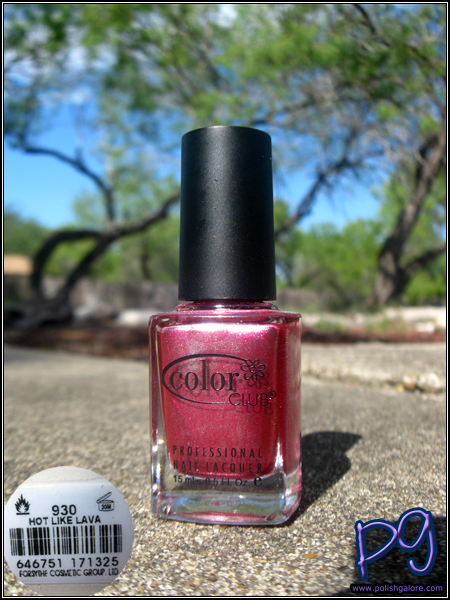 I had to have this shade when I first saw it on blogs and we had no CC at all sold anywhere where I live then - rare to find it now but we have a Sally's finally about 30 miles away and they get some CC in and Rite Aide got a few collections in this past yr - nothing ongoing however. But I tracked this one down on the 2nd market and was happy I did...LOL over it remind you of the song Moves Like Jagger. I just saw this on the side of your blog and had to comment because I watched the PPV 50th yr concert this past weekend of the Stones concert in Newark NJ and kept thinking I had been watching Jagger now for 50 yrs and that songs they sang in 64 and 65 that hit big in the US are now like 47 yrs old...and when they came out I used to think of songs like White Christmas back then as reealllllyyyy old songs! Who knew the music I was growing up with were going to be such movers/shakers/game changers! I need to pull this shade out again - I was given the pink metallic from Pop Beauty and I think the 2 might be really close.